Do you find camping more exciting when you have some outdoor gadgets to take along with you? Or maybe you are wondering if you need any camping gadgets at all. Having some accessories and the best camping gadgets you can take can enhance your camping trip and make you love the outdoors even more. You might be asking yourself: why do I want all of these camping gadgets? As a camper it is your duty to research possible products that can make your trip safer for you and those that may be joining you. This article contains several products that can add a degree of safety to your camping getaways. Some of these products could coax your children out of their rooms and into the great outdoors with you. You might even find yourself having fun with some of the products off of this list. 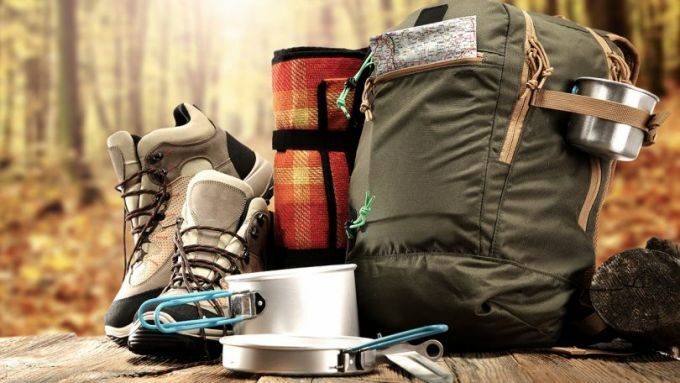 As you will find in this article, you will see the features to look out for when searching for various camping gadgets, and we will give you some reviews of the top items out there that you might want to pick up for your next outing. Even with a wide array of outdoor camping gadgets, there are still features you should look out for when it comes to these gadgets. Below, we are going to give you the important items to consider before you go shopping at the local outdoor equipment store! When it comes to finding new and exciting gadgets, you will want to consider the weight of it as you don’t want to weigh yourself down with items in your backpack. Also, gadgets are there to improve your experience, not make it worse by adding more weight to carry. Most of the items on this list are light in weight and should be able to pack into your backpack easily, without taking up too much space. So, keep in mind the weight of your gear, and then see if and which gadget fits your needs and the overall weight you are able to take. If you are going to pack up electronics to take with you camping, you will want to make sure your items are charged and have backup batteries in case you need them. Otherwise, they will just be dead weight you will carry around or take space in your tent. If you have a way to charge items at a campsite, for example, you can bring along the charger cords for these items. If not, then portable power banks could come in handy. Your new camping gadget should be portable because, after all, you are going to be camping or staying outdoors for a period of time. These items should be easy to carry and store away when it’s not in use. Having portable gadgets, that are light in weight, will make it easier to take with you on each camping trip, as heavy items tend to be too tedious to port around. Also, even if they are light, it doesn’t mean that they are portable. Check the size of the gadget before you order it, to see if it fits your backpack and doesn’t take up too much room where some other, maybe more important gear should be. You will want to make sure that your new gadget will be safe. For example, if you buy yourself a new heater to take with you outdoors, make sure that it has safety features like an auto-shut off, or if it shuts down if tipped over. Another example would be if you purchase a knife, make sure to get a sheath with it so you won’t cut yourself by accident. Your new gadget should be fun and interesting to use! Getting a new waterproof phone case, or a portable shower should be exciting as you can use it outdoors and liven up your camping trip. Also, portable power banks, or solar ones, will allow you to have more fun with your other gadgets that need electricity. However, you need to make sure to read the directions and learn how to use your new gadget before you take it camping, as some gadgets can get dangerous if not used properly. Now, we can get to the fun part! We get to shop for some new gadgets to take with us camping! Keep on reading below for some interesting items that may be right up your alley. We hope that one or more of these items can make it with you on your next adventure! Description: The Carson Universal Smart Phone Optics Digiscoping Adapter can be fasten to virtually every smart phone on the market (this includes all Samsung and iPhone variations). This innovative product is compatible with nearly all optics. The Carson Adapter is compatible with many different models of binoculars, spotting scopes, microscopes, telescopes, Monoculars, endoscopes, iPhones, Samsung, Galaxy phones, and many more products that are in need of a camera upgrade. It comes with all of the accessories you need to get started, one being an EVA storage case. If you think that this product can’t have any other defining features, think again, because it has the self centering technology, two quick release clamps, and two point alignment levers. This smart phone adapter is an incredible product with seemingly zero limitations. It’s best for use with binoculars or any smart phone, because of the way it enhances an otherwise hard to see image. This product is great for anyone with an animal observing hobby, or a photography hobby. Just hook up the adapter to your phone, camera, or binoculars and you’ll be able to see the object of your observations or photographs much more clearly. Related: If you need a scope for this adapter, you can check into the Vortex Razor Scope. It is light, easy to use and is used for straight spotting. 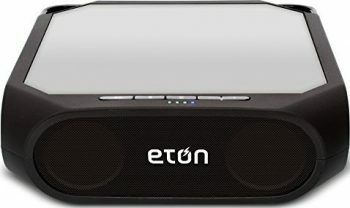 Description: The Eton Rugged Rukus Bluetooth Speaker has a high powered mono crystalline solar panel, and also features an internal battery. This product is great for camping, because it uses solar power to charge your device. So you don’t need to bring a tangle of cords to keep your phone charged up. Also, while your phone is charging, the Eton Rugged Rukus keeps playing your tunes as long as the sun shines. This product is great for sitting by the lake and relaxing with family or friends. You don’t need to worry about it getting wet, because it is durable and waterproof. It’s also handy to play music when you’re just hanging around the campsite. We like this speaker because it gives ample sound, doesn’t sound fuzzy and is Bluetooth ready so you can play your favorite songs as you like! Related: To charge this speaker, you can use the AC Adapter for Etong Rukus which is under $10 and is rugged and built to last. It has a 1 year warranty and is UL Listed. Description: The Wildtek Repel Waterproof iPhone 6 case is ready for any adventure that you throw at it! It is virtually resistant to anything your camping adventure can do to it. If you’re going skiing in Colorado, this case can handle it because it’s snowproof. If you’re going on a dune buggy ride through a forest, this can handle it, because it’s shock proof. If you’re hiking up some sand dunes, this case can handle it, because it is dust proof and scratch resistant. Even though the screen is behind a plastic, it still has its full functionality, and everything can be accessed normally. This case can also brag about it enhanced audio. 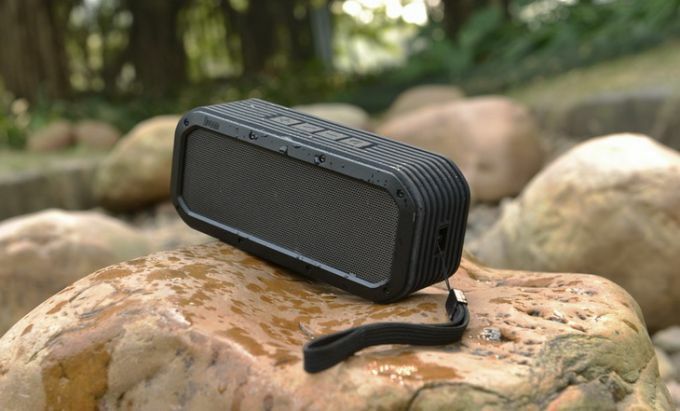 Most water proof cases muffle any sounds that come from the phone, however, the Wildtek REPEL case has clear sound technology which makes for great sounding audio. This case can be used on any camping trip, no matter the destination, and is for all skill levels. Any type of camper can use this case, and save their phone a lot of damage. Related: Be sure to protect your phone’s screen. The iPhone 6 Screen Protector comes in a 3 pack and is made of ballistic glass, all for under $10. Description: The Mr. Heater Portable Radiant Heater can be the saving grace of any camping trip. Let’s say for example, an unexpected cold front pushes through and suddenly, your nice camping trip in the back woods feels like Alaska. This is where Mr. Heater can save your trip, it’s easy to use, easy to power up, and easy to replace the fuel cells. It also features several safety shut off systems. For example, if the Mr. Heater is tipped over, it automatically shuts off to avoid starting a fire. This product can be great for kids because of this feature. Also, if you’re unsure about the weather in the upcoming weekend, it won’t be a hassle to load your Mr. Heater in the car, because it is extremely portable. 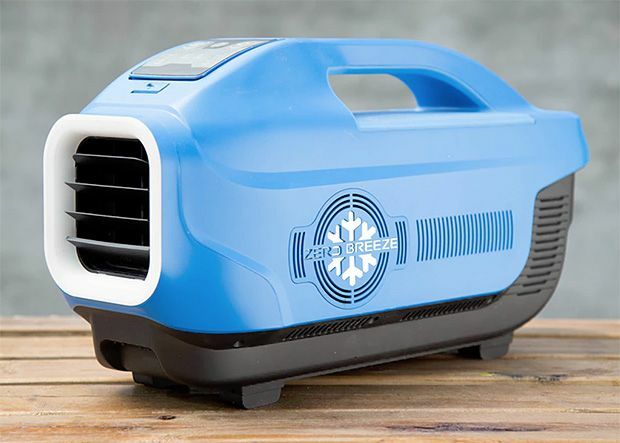 This heater is great for those campers that love to go camping in colder places, but don’t always love the cold. It can also be useful for campers that bring kids along with them, as it is small, has many safety features, and can warm up a tent in no time. Related: To hook this product up to a propane tank, you will need a hose assembly. The Mr. Heater Buddy Series Hose Assembly will fit this model and will run you under $30. It’s 10 feet long. Dimensions: 2.8 x 8.3 x 11 inches (package dimensions). With the hose being 6 feet. Description: This product is perfect for the clean camper! The Ivation Portable Outdoor Shower is portable, light weight and very effective as well. After a long hot day of hiking, all you want to do is take a cool shower, but sometimes the camp showers are all taken, or they haven’t had a good cleaning in a long time. This is where the Ivation Portable Shower comes to the rescue. With this rechargeable showerhead, you can shower at your leisure. This product can save you from the campsite showers, and get you clean quickly with its gentle spray. This product is great for campers who don’t like getting dirty. It is also a great product for campers who are bringing pets along with them to the campsite, as this product is perfect for bathing pets as well. 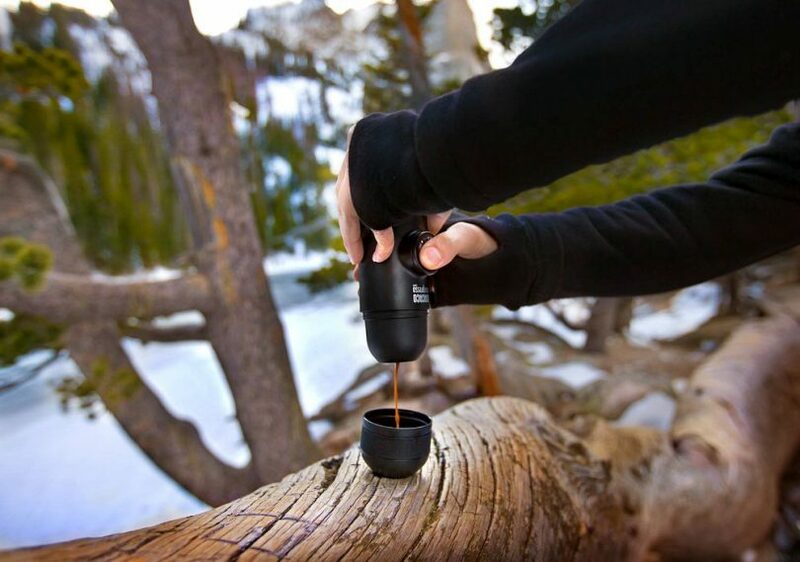 Overall, we love this product and would highly recommend it to outdoor enthusiasts! Related: Have you ever used a shower tent? The WolfWise Pop-up Shower Tent is a great one that is easy to set up, waterproof and easy to clean. Description: Imagine you and your family go camping, it is after dinner and there are tons of dishes! Washing them one by one under a hose isn’t cutting it, and you need the dishes done for the next meal. The Sea to Summit Kitchen Sink can help with this pesky issue. With its nylon material and broad base, nothing can stop you from getting your dishes cleaned, or any other various camping materials. The broad base offers support, so it won’t fall over if it’s full of water, and the nylon makes it incredibly durable. It can also be used as some other sort of container, not just a sink. If you need to empty the cooler and need to transport the water somewhere, the Sea to Summit Kitchen sink is there to help. Or maybe you forgot your cooler? No sweat! The Kitchen Sink can get the job done. The Sea to Summit Kitchen Sink is great for all types of campers. It can be handy for large groups that go camping, who generate a lot of dirty dishes. It can also be useful to a smaller group, in that it offers an efficient and durable container in which to hold water. Related: The Sea To Summit Wilderness Wash is a wash that you can use to get your dishes clean. You can also use it on your body. Under $10 this is a great product to have for sanitary reasons. 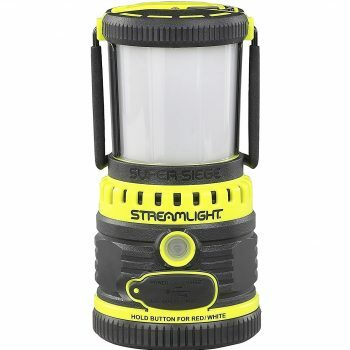 Description: The Streamlight Super Siege Lantern is an amazing product every camper should have. This lantern is incredibly powerful and durable, which means it can handle any situation you might stumble into. From having the extra light to roast marshmallows by, to finding the way out of a possibly dangerous situation, this light can do it all. This product is recommended for all campers. All campers should have in their possession extra lights, or other emergency situation items. This light is high powered, durable, and long lasting. These characteristics make for a great product, and an essential emergency situation item. Even if you don’t have the right equipment to immediately get out of the situation you are in, this lantern could provide a source of comfort in that it will allow you to get your bearings. We love this product because it works well, gives off good lighting and is easy to carry around anywhere. Related: You can charge this lantern using a DC cord. The Streamlight Waypoint Rechargeable DC Cord Flashlight is under $20, high quality and great for lanterns and flashlights. Description: The LifeStraw Personal Water Filter is taking the camping world by storm. This product it a portable water filtration system that effectively cleans any water that you drink. Just put it into a lake or stream and start drinking. This product is great for emergency situations as well. For example, if you get lost on the trail and run out of water, or if you’re on track, but you’ve underestimated how much water you should bring. Whatever the case may be, the LifeStraw is a life saver. This revolutionary product is great for all campers, no matter the skill level. Having a source of clean drinking water is of the utmost importance during any camping trip. Additionally, this product has no limitations as you can use it when you aren’t camping as well! We like how easy this filter is to use and would recommend it because its affordable and works great! Related: Safety should always come first when camping or spending periods of time outdoors. The First Aid Only All Purpose Kit comes with many items you would need if you are hurt in the wild and need some care. Description: The Victorinox Swiss Army knife has any kind of tool you need to get out of any situation you find yourself in. It is durable, reliable and a tool that every camper should have in their backpacks. The Swiss Army Company has been around for a while, so you know they know how to manufacture a top notch knife. This particular knife features two screwdrivers, a blade, a serrated blade, and some other various specialty blades that could help you out of a bad situation. This knife can be used for a variety of tasks by all different kinds of campers. It offers several different blades for any situation you come across. The Swiss Army knife is a jack of all trades kind of knife, one that you can rely on to get you out of any situation. We like this knife because it stands up over time, is durable and great for using in the wild! Related: Keep all of your blades sharpened with the Smith’s Sharpener, which costs under $10 and has a tapered diamond rod and works quickly and easily. With all of the gadgets on the market for camping, we know it can be hard to choose which one to enjoy! From portable showers to knives and more, we hope you are excited to use one or more of these products in the near future! No matter the season, you can find a camping gadget that is functional, safe, and easy to use while you enjoy the great outdoors. Which one (or two!) will you choose? Was there any useful gadget that we forgot to mention? Do you have a story that you’d like to share about a handy doodad you can’t seem to live without? Leave us a comment below and share it with us. Who knows, you could be helping someone else struggling with a similar problem you’ve faced before. Also, be sure to share this article with your friends, family, and fellow campers.